Traveling abroad: When you in a hotel or coffee shop in other countries,you do not know how to charge your mobile phones and computer, this All in One Adapter Plug will help you a lot. 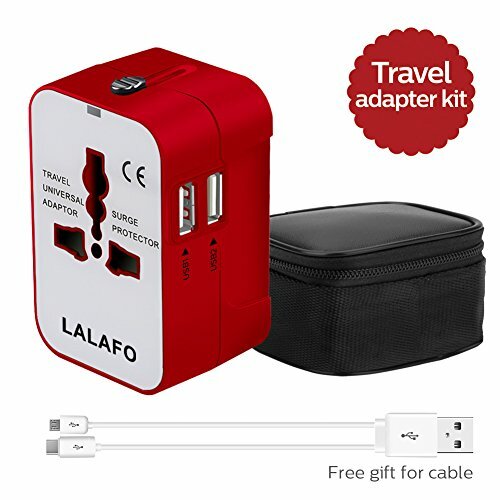 This Travel Adapter Plug fits well with people who like to Traveling or business trip to other countries.It is pretty convenient if you have many devices with USB ports.Laptop and mobile phones can be charged in the same time in one unit. The Travel Adapter with 4 international plug adapters.Covers more than 150 Countries with US/EU/UK/AU plugs, but adapter cannot be used in South African, India, Swiss and Italy.Please kindly noticed this problem. The Electrical Output Current and Voltage can not be converted.Please check appropriate device voltage before using this adapter. It is not suited for high-powered electrical appliances. Rated Power:110V-/650W,220V-/1300W. This Travel Adapter does not working with high power appliances such as flat iron, hair curler, hairdryer, steam iron, hot water heater, coffee maker, etc. Worldwide Travel Adapter is easy to use,portable and safety.This Adapter do a great job if your devices cannot match the plug type in other countries.It works well with the most of USB Devices,such as Mobile Phones,,Laptop,Camera,Tablet,Power Bank and other Electronics Products via this Dual USB Charging Ports. Application Scenarios:Traveling,Business Trip,Hotel,Home,Meeting,Office or Coffee Shop. Safety Protection:All-in-one Travel Adapter with Fuse Protect, Built-in Safety Shutters, LED Power Indicator.The Rated Power:110V-/650W,220V-/1300W. Warranty: Offer 12 Months Warranty Policy and 24h*7 days Customer Services, Please Contact us If you Need Any Help. If you have any questions about this product by LALAFO, contact us by completing and submitting the form below. If you are looking for a specif part number, please include it with your message.